How Do You Know - If You Have Poor Circulation? Let's start with the top 3 basic warning signs indicating you may be suffering from poor circulation. Are your hands and feet frequently cold even in normal room temperatures (70 degrees)? Does your nose often feel cold even if the weather isn't? Do you feel numbness or tingling in your fingers and toes? If so, there's a good chance your circulation is not great. These 3 symptoms alone, can indicate you have poor circulation resulting from lack of blood flow to the extremities. More extreme symptoms would be dizziness, fatigue, hair loss, and even an upset digestive system. Of course, all these indicators of poor circulation can be linked to a particular underlying health issue. There are alternative measures you can take to safely and effectively improve your body's circulation and regain your health. Stop (or at best cutback on) smoking cigarettes. Exercise regularly. If you can't run then go for a brisk walk. Avoid long periods of sitting and laying down. Get up and move around periodically, it helps. After exercising, put your feet up. Elevating the legs and feet is good for the heart. Eat a healthy diet and stay hydrated by drinking more pure clean water. Restrain from drinking alcohol and drink more (green) tea. Wear Far Infrared Clothing often to stimulate your body's circulation. Fortunately, just by simply wearing far infrared clothing you can improve your circulation. FIR dilates blood vessels and arteries to allow increased blood flow to the extremities. It's not a "take a pill overnight wonder". That's not how it works. Far infrared rays gently penetrate deep into the soft tissues of the area where you are wearing the product. What you feel is soothing warm and relaxation. This healing energy is natural, safe and very effective. FIR energy has been been proven to improve circulation. Helping to speed the delivery of fresh oxygen and nutrients to areas of your body in need of repair. Through this dilation process, toxins are released from the cells and flushed from the body. As mentioned above, there are plenty of simple changes you can make to improve your vascular system and overall health. Exercise more and change your diet. Consume more alkaline foods to reduce the acidity in your blood. There are so many factors that can relate to poor circulation. We recommend you always consult with your physician. Far infrared energy clothing is a complimentary therapy. It's not a replacement for everything else you are doing to improve your health. It's helping thousands of people and it can help you too! Far infrared health products are safe, effective and affordable. Prolotex™ RELAXED FIT FIR Socks are Best socks for promoting circulation. 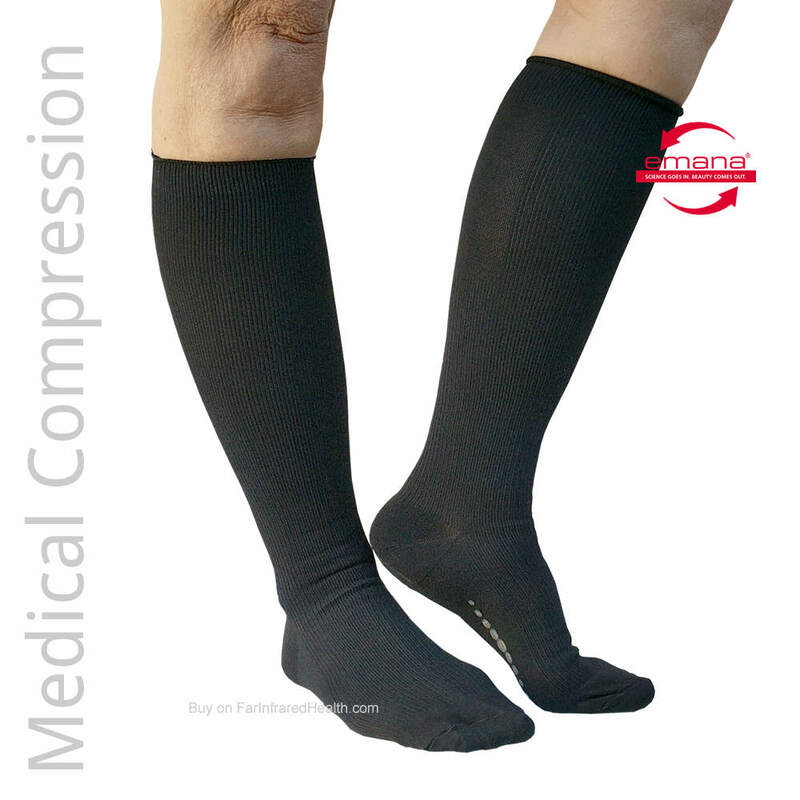 This Non-Binding Sock is suitable for individuals with thicker swollen limbs & ankles. Do you suffer from poor circulation in your hands while sleeping? Here's a natural treatment plan for poor circulation in your hands. Start by making healthier choices in diet and exercise. Make sure you are drinking enough fresh water and liquids to stay hydrated. Try and reduce consumption of refined sugar, salt, trans fats and alcohol. This will reduce the overall acidity in your bloodstream. Take a practical approach to your (cardio) exercising. You need to increase your heart rate daily but be careful not to over do it. Regular and moderate exercise is shown to deliver the best results. Wearing Far Infrared Gloves is a great way to also improve circulation in your hands. FIR gently expands the blood vessels and capillaries allowing more fresh oxygenated blood to circulate. A warm soothing feeling can be felt as circulation is restored. There are so many factors that can cause poor circulation in your legs. Healthy decisions in diet and exercise help boost your metabolic rate and deliver positive results. Choose to reduce intake of refined sugar, salt, trans fats and alcohol and you will feel the benefits. Far Infrared Pants, Knee Bands and Calf Sleeves can promote circulation in your legs. Why do Far Infrared products help improve circulation? Our high quality Far infrared products are fused with a safe formula of bio-ceramics that emit healing (FIR) far infrared rays. FIR energy gently penetrates deep into the soft tissues of your body and increases microcirculation. Increased circulation equates to increased cellular metabolic functioning. This results in less fluid retention and pooling of blood in the lower legs. When the tiny capillaries and veins in your body dilate, fresh oxygenated blood containing vital nutrients reach all your extremities including toes & fingers.